Since Oliver’s Nest will live in a very cold climate, the air barrier should be to the inside and latex-painted barn board attached to thin plywood will serve that function. In Oliver’s Nest, substitute ceder siding and metal roof panels for the painted stucco with paper bond break. They act similarly. Then the thin rigid foam panels, which were going to serve as the drain field. But the author recommends building paper (ah-ha!) as the drain field. 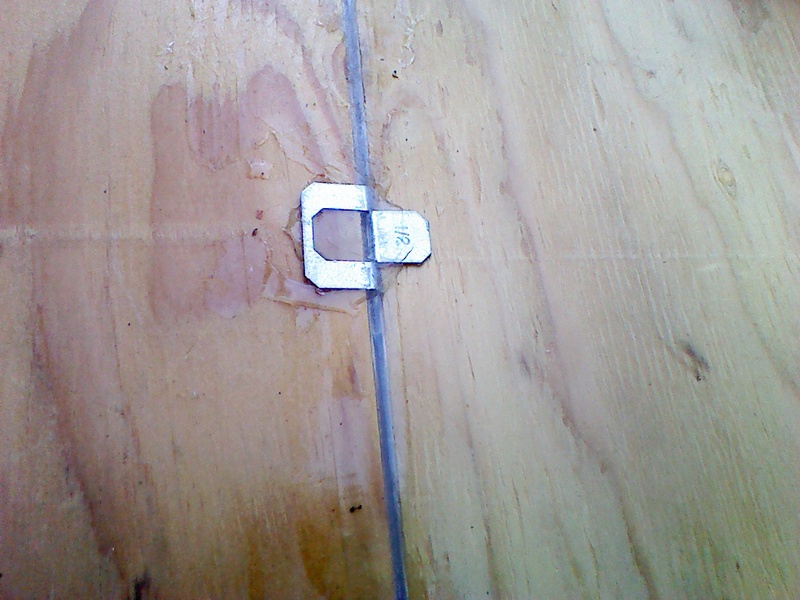 Then, plywood sheathing and the wool inside the wood stud cavity. On the interior of the wall will be a very thin layer of plywood and latex-painted wood boards (fastened to the thin plywood), which act like the “Kraft facing on a fiberglass batt or a “smart vapor barrier membrane” combined with the latex-painted gypsum board. I researched and it’s a very fine substitute. The big change is that my drain field *was* going to be the water-impermeable rigid foam panels, instead of the more water-permeable building felt. This change allows a much easier exit for water vapor inside the wall assembly. It’s important. I’m glad I caught it. If I were able to use much thicker foam insulation, I would go with the above design, but I’m limited by house width and (mostly) financial constraints. If I had the funds, I’d go wide. After all, the roof is almost 10 feet across. In fact, now I’m wondering whether to use the foam panels at all, as they won’t provide a thermal break as much as the drain field does, rendering them pretty much unhelpful. They are a process I think I can safely skip. Very nice. I have a future project on my property that they were originally intended for anyway. Yeah, there are wide gaps…I know. Ugly but functional. 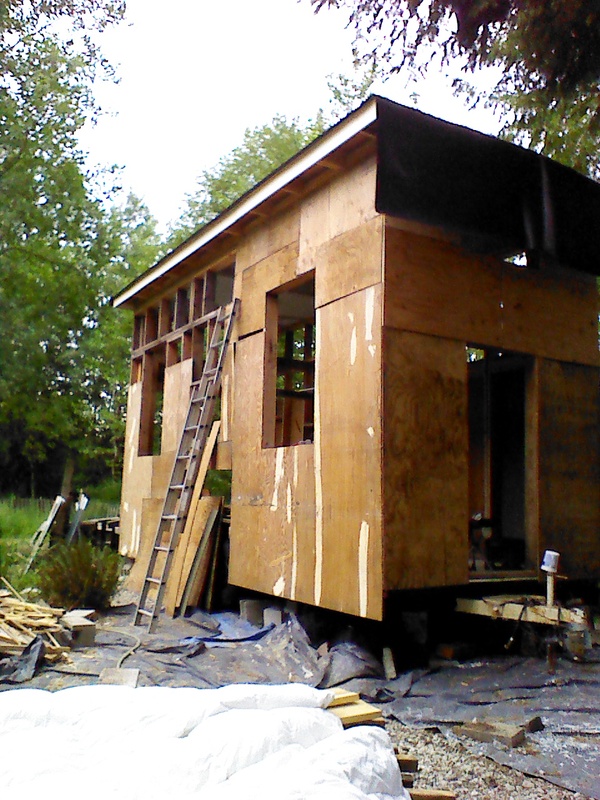 Now just the upper part of the North side and I can go forward with the building felt. I had a couple rolls from the Restore that got wet in a sideways rain storm, so went back and got a couple more for $5 each. Not happy that the originals got ruined, but so it goes when you don’t have an indoor space to build and store supplies. I’d recommend one. Based on my past performance, it’ll take a couple to three days to finish getting up the plywood. I have no idea how long hanging the building felt will take. Hopefully not more than a couple days. We’ll see! Oh! And the wool? It’s drying so fast that I’m fluffing a couple times a day instead of every couple days, so the whole process is going super quick. It’s looking like I won’t need the dehumidifier. Unless it starts raining again before I get this baby weather-tight. My poor knee. My knee kneeds (hee) some time to heal, so now that the roof is mostly on, I’m going to stop working for a little while. My doctor had told me to stay off of it for a couple months and knit or something, but I just couldn’t til now. Weather and building a house trumps comfort sometimes. It’s apparent in the photos how the edges are still loose ~ I have a fascia idea I want to try still before it all gets affixed. EPDM sealed down except at the edges. A LOT of my rabbits got free from a hidden burrow of their pen. They like to come down and hang out with me. Please ignore the drying laundry, LOL. Seriously, this is long-term camping these days, complete with wee beasties at my door. I got the underlayment cut out on half the interior and made some interesting observations. First off, it definitely looks like a more recent water incursion (thank goodness). 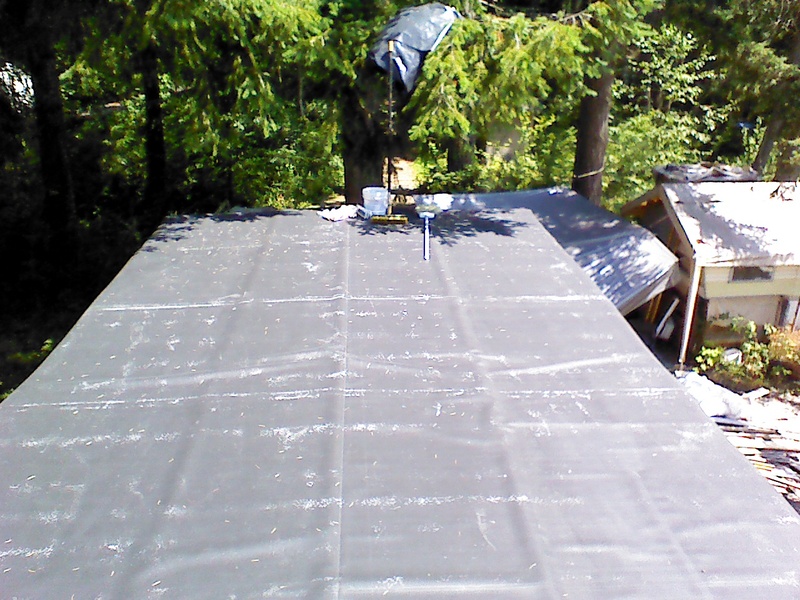 I’m sure that it got wet this past spring after I took off the tarp ~ I should have waited for drier weather. It’s hard to know in these parts when that’ll happen, though. The tarp I had over the floor didn’t cut it, and leaked around the edges (I’m guessing). The underlayment underside, showing how the water got in at the edges. The house appears to have settle slightly to one end and more slightly to one side. The great part about that is the water settled there, too. Well, mostly. The puddle was there, but higher parts were damp to quite wet. I cut down through the layers to the insulation, and removed some sections of it to dry and to allow the structure to dry. I just stir the wool up every couple days to help it. The wood is all ok, even the parts that were somewhat underwater. It’s drying out well. Because of an oddity to my joist design, most of them weren’t even wet. I used a sort of box idea to hold the wool and built it 6 inches deep. To allow a thermal break, I only hung 2x4s for the joists, leaving a space between the bottom of them and the floor of the box. This worked well except in the middle of the house, where I didn’t get them fastened in tightly and securely enough (springy floor!). I haven’t decided whether to wait until everything is dry to fix that or if I should just go ahead and pull that part out now and redo it. It will hasten the drying if I do it now, perhaps. The rigid insulation is holding up well, even wet. It’s drying too. 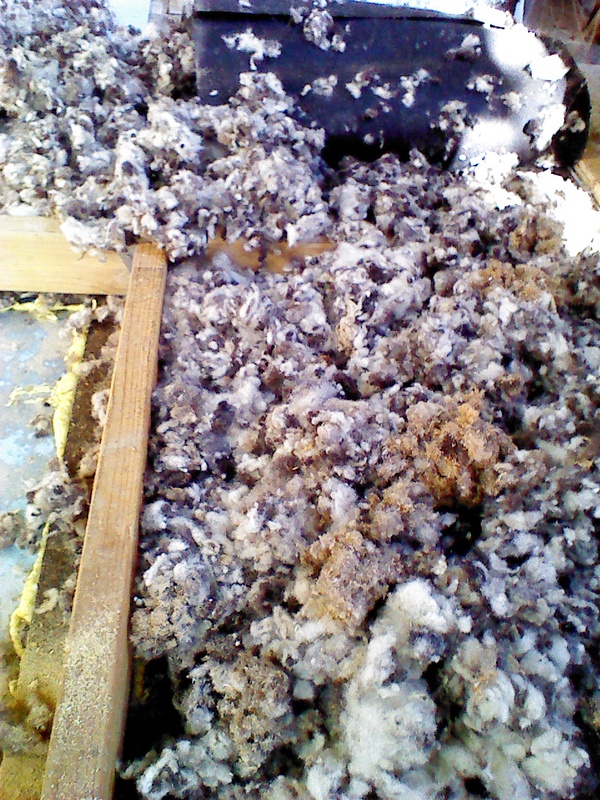 Rigid foam board under the wool revealed to allow it to dry. Plywood underlayment cut and pulled off to expose the wet wool. Wool is wet and still fluffy! The space below the floor joist is visible in this picture, too. The brown is just sawdust from cutting the plywood. On the left is a joist and rigid foam boards underneath. The wool is the most interesting part. One of the many reasons I choose to use it was due to it’s high insulating value even when wet. It is still fluffy and thick and has no mold or weird smell. It’s wet as a sponge in parts though, and I might need rent a commercial size dehumidifier to completely get it all dry, after the house is closed up. I think I’ll do that even if it all “looks dry”….just to be safe. While that all is drying, I’ll finish hanging the wall sheathing, and then hang the rigid foam insulation on the outside of that. It’s super light, so that part should go quickly. I have some rigid foam glue that I’ll use at the corners of the building, and I’ll nail it up all over with these special nails with plastic washer-things I got at the ReStore. I do not intend to use building paper as originally planned, as I want the entire wall assembly to be able to breathe to the outside. Instead, I’ll just have the plywood sheathing, then the rigid foam boards, then some blocking for a rain screen effect, then the siding. To allow wetness out at the bottom of the wall assembly there will be a small gap around the entire house, which I’m thinking to cover with a wire mesh. The last thing I want is mice or other critters to get up in there! I found a big roll of wire mesh at the ReStore the other day, enough for the whole house and only $10. I’ll have to figure out a way to securely attach it to both the inner, foam and plywood section and the outer, sheathing section without it showing. After all that, I guess the next part is weather-sealing the door and window openings, then installing them. After that the house will be officially “dried in” and that’s when I’ll rent the dehumidifier to finish the floor. The weather should hold reasonably well through the end of September (fingers crossed), which gives me a little time….I just want to get my knee to a less pained state and hopefully get it healed enough. Living alone on a mountain will be challenging enough without being lame, LOL. OK, off to play some Civ 5 or something! After working on this roof, I’ve come to the conclusion that it’s really not that hard to work with EPDM. You have to use the proper materials and pay attention to detail, and preferably work with another person (I’ll say why in a minute) to get to a good result. If you want a low-slope roof and fear water intrusion, it’s a good choice. It is very tolerant of temperature extremes. It’s flexible and of course that’s a great quality in a moving home. It should last for years – up to 50 in some installations! That’s one of the reasons why you’ll find it in commercial buildings – they don’t want to be replacing the roof every few years. It’s easy to repair if it gets a tear for some reason (generally due to improper installation, from what I’ve read). 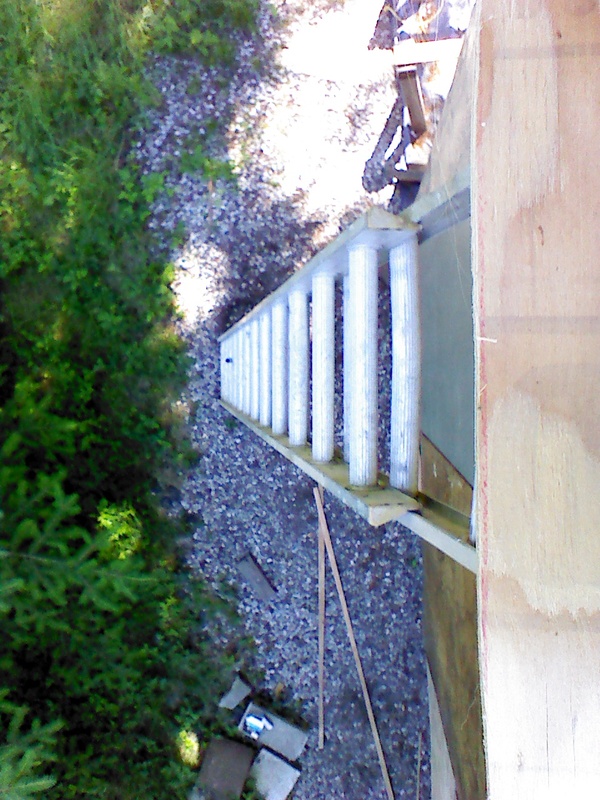 It works for green roofs, walkable decks, ballast (gravel) applications and fully adhered – like mine is, and on any slope, even super steep ones. So why do you want a helper? It worried me to see that in every installation instruction I found, two people were shown working together, and I hoped I’d be able to do it well by myself. Now that I’ve got it half done, I know why! First off, the stuff is heavy at 2 pounds per square foot. Due to it being floppy, it feels heavier. Of course, I have the strength of a baby bird these days…. It’s easier to keep all wrinkles, creases and bubbles out with two people working at either edge, and those are the bane of rubber. Well, those and inadequate sealing at the edges. Adhering goes MUCH faster with two people, as you can do half the roof at a time, keeping the total time spent under 3 hours. Alone, it took me 6 hours to get half the roof done yesterday. 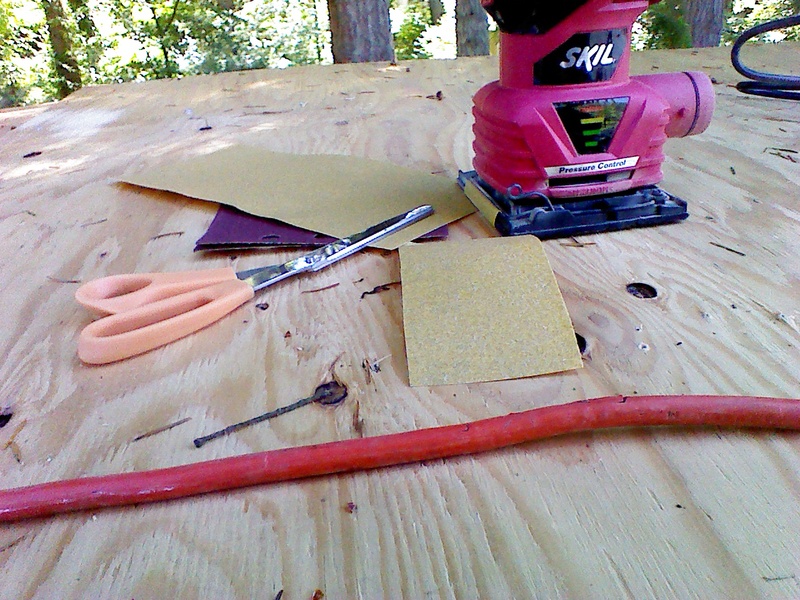 You have to put glue on both the roof decking and on the EPDM, then wait for it to “flash off” (get to a nearly dry state), before carefully stretching the rubber and laying it down perfectly smooth and then smooshing it down very firmly with a push broom. Flashing off takes up to an hour. Since I can only handle a small section at a time, you see how it takes lots more time doing it alone. It’s fun though! I’m having a blast messing with the glue – for some reason it’s like playing to me :). I get to work and stop (and read) to wait for the glue to be ready, work and stop, work and stop – and I don’t feel lazy because taking periodic breaks are a required part of the process! The glue goes on like thick paint. Please ignore the photo-bombing hair…!